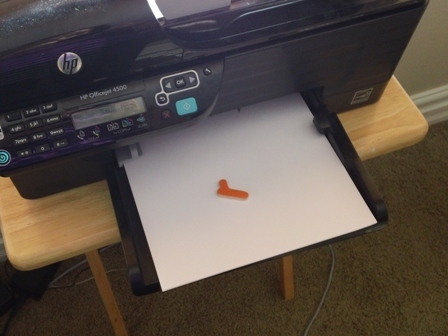 Is this a part of your printer? Apparently my little boy thought we didn't have enough stuff in ours. I went to print some coupons this morning and nothing was printing! After trying and trying to figure it out myself I finally had my husband look at it. 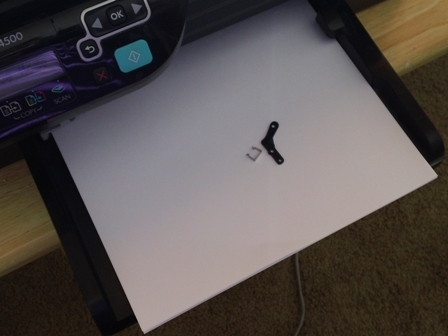 Come to find out my little boys obsession with pushing buttons had reached the printer! He had pushed enough buttons on it to totally reset the IP on it, so nothing from my computer was even reaching it. Luckily my husband solved that pretty quick, and as soon as it started printing we got a paper jam! My husband kept pulling sheet after sheet out of ripped up paper. We couldn't figure out why it kept jamming, until my husband opened it up completely and found a little orange "r" shoved into it! I thought for sure printing while a little piece of wood was in it would surely break it! So I went to test it once the "r" was out and it made the worst sound I have ever heard a printer make! So I held my breath and pushed print... and it works!! I can't believe it! After having a wooden "r" shoved up it and loosing two parts it still lives to fight another day!! Moral of the story... if it ain't broke, don't let the kiddos near it!